Videotapemusic - Souvenir. Vinyl LP. Bleep. Another fine example of the bubbling underground music circuit of contemporary Japan from the 180g label. 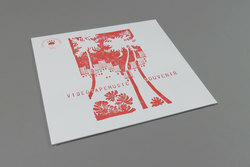 Whereas the debut release from Ajate seemed to revolve around a fusion of traditional styles, this inventive album from Videotapemusic seems firmly rooted in the musical prospects of futurism. Since 2009 the young producer has been creating audio visual works which stem from recycling dusty old Asian VHS tapes trawled from dusty thrift stores. Where things go to die, Videotapemusic seeks to source new life. Sax, steel pan drums, steel guitar and keyboards all club in atop the vast array of samples to provide a unique listening experience. We patiently await more from 180g!